Estas foram as palavras de convite no feichamento do Encontro de Musicos na floresta invitando os irmãos para este encontro historico em São Luis no Maranhão, terra do Mestre Irineu. 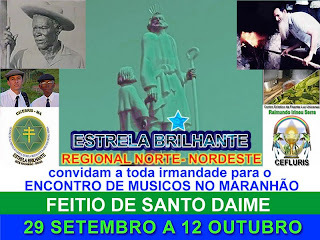 Organiza igreja Estrela Brilhante - Sr Daniel Serra e Chester Gontijo - regional Norte-nordest. This happen during the closing hinario of the Meeting of Musicians in the Rainforest where Mr. Daniel Serra (grandson of Mestre Irineu) invite the brothers and sisters to the celebration of the Meeting of Musicians at Maranhão. 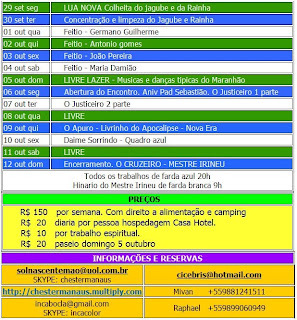 Organized by Estrela Brilhante Church and Chester Gontijo. From 29th september to 12 october.